Kabir Sahib | How was the Temple of Shri Jagan Nath built in Puri? / How was the Temple of Shri Jagan Nath built in Puri? In Orissa state, there was a king named Indradaman. He was exclusively devoted to God Shri Krishna Ji. One night Shri Krishna appeared in king’s dream and said that get a temple of mine built by name Jagannaath. Shri Krishna Ji also said that idol-worship is not to be done in this temple. Only a saint has to be left in it who should impart knowledge according to Holy Gita to the visitors. He also showed the place on the seashore where the temple had to be built. On waking up in the morning King Indradaman told his wife that last night I saw God Krishna Ji. He has instructed to build a temple. The queen said, “Why delay an auspicious task? The entire wealth has been given by him only. Why think in offering it to him?” The king got the temple built in that place which Shri Krishna Ji had shown on the seashore in the dream. After the temple was built, a cyclone arose and demolished the temple. Not even a trace was left that there was a temple here. Like this, the king got the temple built five times. On all five occasions, the sea demolished it. Being disappointed, the king decided not to build any temple. He thought that God knows which birth’s revenge the sea is taking from me. The treasury became empty; the temple did not get built. After sometime, Supreme God (KavirDev/God Kabir) according to the promise made to Jyoti Niranjan (Kaal) came to King Indradaman and said to the King, “You get the temple constructed. This time the sea will not demolish the temple (palace).” The King said, “Saint Ji, I do not believe it. I have been getting the temple constructed by the order of God Shri Krishna (Vishnu) Ji. Shri Krishna has not been able to stop the sea. I have got the temple built five times thinking this that God might be testing me. But now I am not even worthy of giving a test because even the treasury has become empty. Now I am not capable of getting the temple built.” God Kabir said, “Indradaman, the Parmeshwar who has created all the brahmands, only He is capable of doing everything; not other gods. I have the ‘word’ power of that Parmeshwar. I can stop the sea (hiding himself, was telling the truth).” The king said, “Saint Ji, I can not accept that there is some other God more powerful than Shri Krishna Ji. When even he could not stop the sea, then what can an insignificant person like you do. I do not believe it and nor is my financial state suitable for constructing the temple (palace).” KavirDev (God Kabir) in Saint form said, “King, if you feel like constructing the temple, then come to me. I live in so and so place. This time the sea will not demolish the temple.” On saying this, God went away. King Indradaman woke up from sleep and narrated the whole account of his dream to his queen. The queen said, “If God is saying then you must not fall short. Get the palace of God built again.” On hearing the goodwill speech of queen, the king said, “Now even the treasury has become empty. If I will not get the temple built, then God will become displeased. I am caught in a religious crisis.” The queen said, “I have some jewellery kept with me. The temple will easily get built with them. You take this jewellery and obey the order of God. While saying this, the queen taking out all the jewellery which was kept at home and which she was wearing, surrendered it in her husband’s feet for the sake of God. King Indradaman went to that place which Parmeshwar had told in Saint form. On finding Kabir Prabhu i.e. the anonymous Saint, requested to stop the sea. 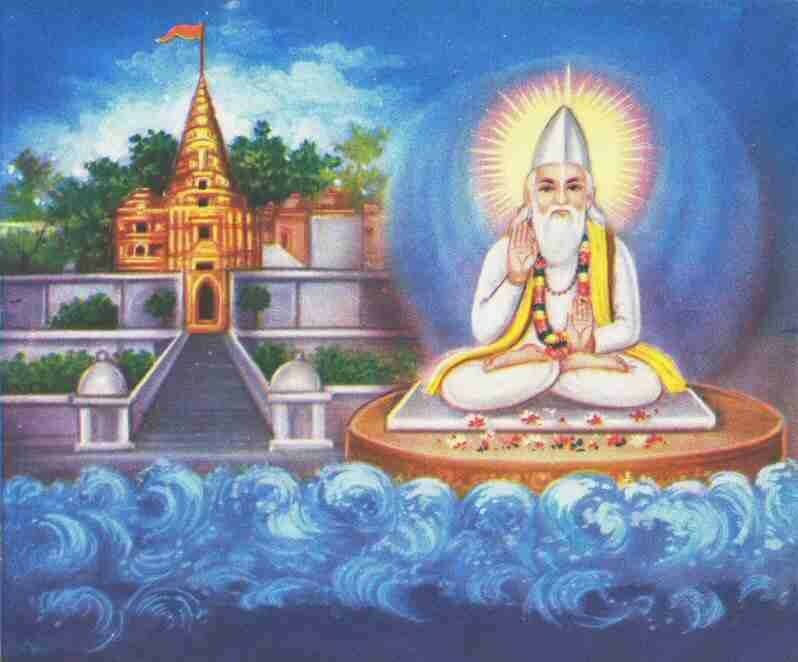 God Kabir Ji (KavirDev) said that the direction from which the sea comes rising up, get a platform built there on the seashore; sitting on which I will do bhakti of God and will stop the sea. The king got a platform constructed from a big stone by the sculptors. Parmeshwar Kabir sat down on it. The construction of the temple started again for the sixth time. When twelve days had passed in making the idols, Naath Ji arrived. Naath Ji asked the king, “Indradaman, did you make the idols?” The king, with folded hands, said, “your orders have been fully obeyed, Mahatma Ji. But it is my misfortune that the idols are not getting made. When half-made, they break into pieces. He sent for the pieces of the idols by the servants and showed them to Naath Ji to make him believe. Naath Ji said that the idols have to be made. Get them made now. I will see how they break. The king said, “Naath Ji, effort is being made. A God-sent eighty-year-old experienced craftsman is making the idol in a closed room. He has said that after completing the idols, he will open the door. If anyone will open the door in the middle, then to whatever extent the idols will be made, they will remain that much. Today it has been twelve days since he started making the idols. Neither has he come out, nor has eaten or drunk anything. Naath Ji said that we should see the idols, how he is making them? What will be there to see once they have been made? If they would not have been made correctly, then we will get them made correctly. Saying this Naath Ji taking King Indradaman with him went in front of that room where the idols were being made and called out, “Craftsman, open the door.” Called out several times, but the door did not open, and the sound of ‘khat-khat’ which was coming also stopped. Naath Ji said that you were saying that he is an eighty-year-old man; he has not even eaten or drunk for twelve days, now even the sound has stopped, he might have died. They forcefully opened the door; saw that three idols were kept, the digits of hands and toes of the three had not been made. The craftsman had disappeared. The temple got built and seeing no other way out and firm on his insistence, Naath Ji said, “Install the idols like this only; perhaps, this only is accepted to God. It seems that Shri Krishna had himself come and made the idols. Then Parmeshwar Kabir (KavirDev) said, “I only had reached there as well. I only had saved the remainder of it. Now go and swallow the remaining Dwarika as well, but do leave that memorial place where the last rites of Shri Krishna Ji’s body were performed (A very big temple was built on the place where the last rites of Shri Krishna Ji were performed. This monument will remain as evidence that actually Shri Krishna Ji had died and had left his body of five elements. Otherwise in the time to come, people will say that Shri Krishna Ji had not died. 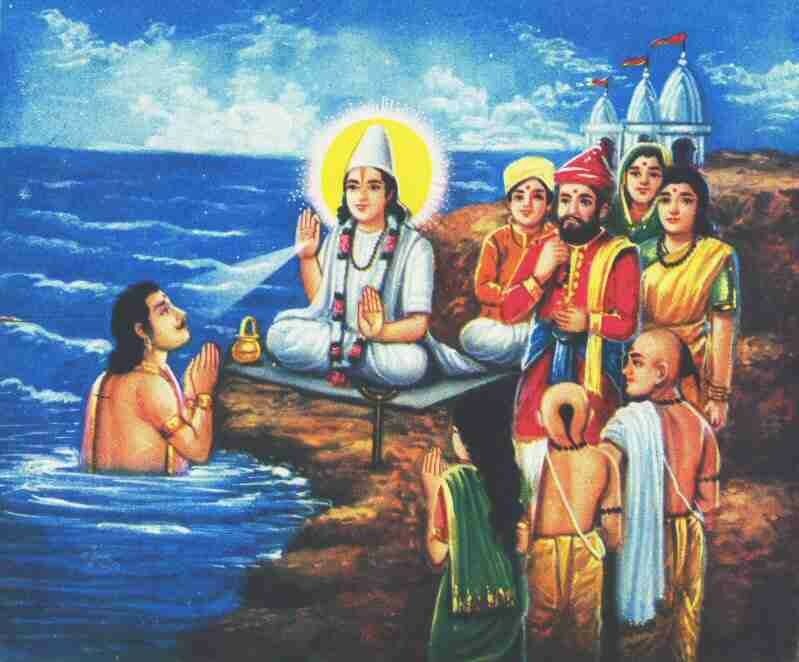 ).” On getting permission the sea submerged the remaining Dwarika as well. Parmeshwar Kabir Ji (KavirDev) said, “From now on you must never attempt to demolish this Jagannaath temple, and move away from this palace.” Obeying this order of God, the sea bowed down and moved approximately one and a half kilometre away from the temple. In this way, the temple i.e. Dhaam of Shri Jagannaath Ji was established. After a few days, the Pandey, who had pushed God Kabir Ji in Shudra form, developed leprosy. Even after taking all kinds of treatment, did not get cured. The suffering of leprosy kept on increasing. He also performed all the religious services, repeatedly cried before Shri Jagannaath Ji and prayed for the removal of suffering, but everything failed. Shri Krishna Ji appeared in his dream and said, “Pandey, wash the feet of that Saint whom you had shoved on the main door of the temple and sip that foot-nectar (charnamrit). Then by His blessings your leprosy can get cured. Only if he will forgive you from His heart, otherwise not.” What choice does a dying man have? That chief Panda woke up in the morning. Taking many fellow Pandas with him went to that place where God Kabir was sitting in form of the Shudra. As soon as the Panda came near to God, Parmeshwar stood up and started walking, and said, “Panda, I am untouchable; stay away from me. You might become impure. Panda approached nearer; Parmeshwar moved further forward. Then the Panda burst into tears and said, “Parvardigar, forgive my fault.” Then the kind God stopped. Pandey respectfully spread a clean cloth on the ground and requested God to sit on it. God sat down on that cloth. Then that Panda himself washed God’s feet and put the footnectar (charnamrit) in a bowl. God Kabir Ji said, “Pandey, drink this for forty days as well as bathe by putting some in the bathing water. Your leprosy will get cured on the fourtieeth day”, and said that even in future, if anyone will practice untouchability in this Jagannaath temple, then will get its punishment. All the people present there promised that from today onwards no untouchability will be practiced in this sacred place. Please think: - This is the only temple in India where from the beginning there has been no untouchability. Even I (this Das) got the opportunity to see that place. I had gone with several disciples to see that place that let us gather some evidence. There, even today we found all the proofs to be evident. The stone (platform) sitting on which Kabir Parmeshwar Ji had stopped the sea to save the temple is present even today. A dome has been built on it as a memorial. A monastery is also present there from the very old mahant (guard) tradition/succession. There, on asking about the information on the above-mentioned protection of the temple from the sea from a nearly seventy years old Mahant Ji, he also told the same thing and said that my ancestors have been Mahants (guards) here for many generations. Here only, Shri Dharmdas Ji and his wife Bhaktmati Amani Devi had given up their bodies. He also showed their graves made adjacent to each other. Then we went inside the temple of Shri Jagannaath Ji. Even today, there is no idol-worship there. But have definitely displayed an exhibition. Now pious souls should think that how much the truth has been suppressed just by saying a leela of Jagannaath. Sacred monuments are respectable, but self-welfare is only possible by doing bhaktisadhna according to the Tattavgyan mentioned in Holy Gita Ji and Holy Vedas and as given by Parmeshwar Kabir Ji, otherwise, because of being opposite to the scriptures, the human life will be wasted. Evidence: Gita Adhyay 16 Mantra 23, 24. In the temple of Shri Jagannaath, according to the order of God, it is only auspicious to sing the praise of the glory of the knowledge of Holy Gita Ji, and self-welfare is only possible by doing sadhna according to the way of worship mentioned in Shrimad Bhagwat Gita Ji, otherwise, there is no benefit just by visiting Jagannaath Ji or by eating Prasaad of khichdi because this action because of not being mentioned in Shri Gita Ji is against the scripture, which is evident in Adhyay 16 Mantra 23, 24.